WHAT IS THE "HOLEY BAFFLE" AND HOW WOULD YOU USE IT? The Chocovision Revolation V, Rev Delta & Revolation 3Z offer a holy baffle accessory and we are going to discuss this in more detail to see when and how this accessory would be beneficial to your workflow. 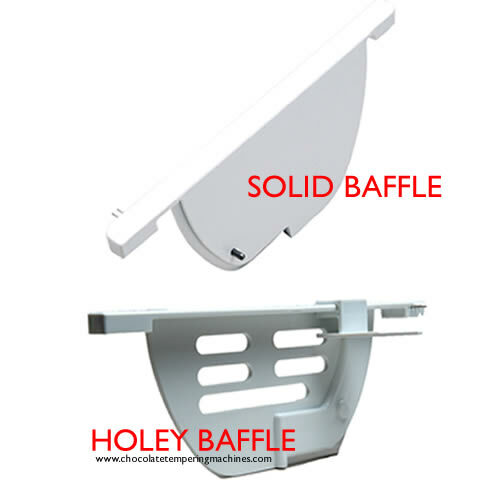 What is the Holey baffle? The standard solid baffle sits in the middle of the bowl splitting the bowl in half. Your solid chocolate is held behind the baffle, and as it melts it flows around to the front of the baffle to be tempered. So, you only have half of the bowl capacity for your melted / tempered chocolate. (Illustration above shows solid baffle in Rev2, with tempered pool of chocolate in front). The "holey" baffle actually has holes in it, which allows the melted chocolate to flow back through, thereby utilizing the whole bowl (which almost doubles the capacity of melted chocolate that can be held in the bowl!). (Illustration shows baffles for Rev2, baffles may be slightly different for other models). How would you use the holey baffle? The holey baffles allow you to melt and temper more chocolate per batch. 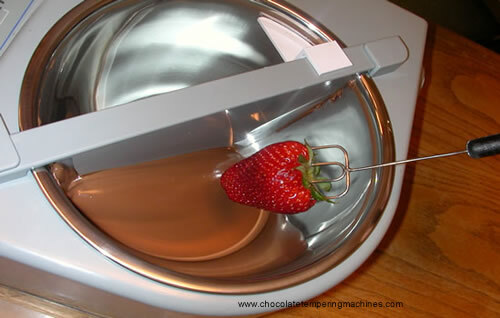 So, you would use the holey baffle when you want to increase your daily output or to temper more chocolate as needed! 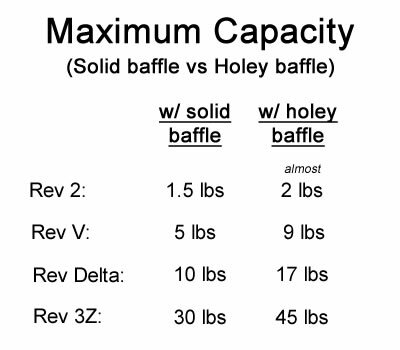 See maximum capacity differences (solid baffle vs holey baffle) for each machine below:. The holey baffle will increase the speed and efficiency of your workflow by allowing you to do larger batches as you need them!